On the Fleurieu Peninsula in South Australia the picturesque city of Victor Harbor is located. The city draws a significant amount of tourists each year from various corners of the world and many Australians also choose it as their summer destination. Various activities on the coastal paradise, its pristine beauty and the wonderful climate have made it an ideal vacation spot. The Victor Harbor city falls in the state district of Finniss and within the federal division of Mayo. In the mid 19th century the place was discovered and named after a ship in which the explorers had traveled. Since 1863 the development of the city began and then it was known as Port Victoria. It was only in 1921 that the name of the city was changed from Port Victor to Victor Harbor. The Victor Harbor city council is responsible for the administration and governance of the city. There are nine councilors and one mayor and one deputy mayor in the city council. The councilors are elected after regular intervals. The climate of Victor Harbor is purely of Mediterranean type. Temperature is moderate through out the year. There is cool breeze in summer and the winters are also mildly cold. Winter is a perfect season for a vacation in this city. There are various attractions in Victor Harbor among which the best is the scenic pristine natural setting of the city. The city lies in the juncture of the Encounter Bay and Southern Ocean and in its close proximity lays Cape Jervis and the Kangaroo Island. Some of the points of attraction in Victor Harbor are Victor Harbor Horse Tram, art galleries, golf courses, and Australia whale center, Granite Island, Greenhills Adventure Park, and Cockle Train. The city has a number of beaches which are surfer�s paradise. Some of the beaches in the city are Middleton, Parsons and Goolwa. Apart from surfing the other activity which is popular on the beaches of Victor Harbor is surf fishing. Walking, cycling, horsing and water sports are the activities which can also be enjoyed. 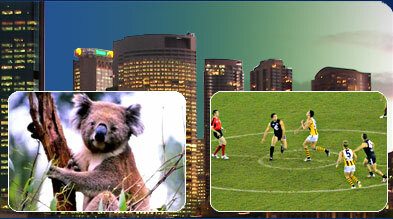 Some of the rare animal species like whale and penguins can be seen in this city. The local wineries produce some of the best wines in Australia and the tourists can also visit these wineries if they wish. The best time to visit the city is during the schoolies festival which takes place every November. The eateries in this city are abundant and varied. There are numerous licensed restaurants and ice cream shops, pubs and cafes where the tourists can enjoy themselves thoroughly. The local seafood and wine are the two delicacies which should be tasted while in the city. Victor Harbor is just 80 Kilometer from Adelaide and it takes just an hour by car.